Texture or stucco plasterwork can add the charm of Old World-style European walls. The look may be painted any color and can be added over most surfaces, including painted walls. Still, before adding heavy amounts of texture to your home's walls or ceiling, undertake the proper prep work. Understand the best way to add texture to your painted walls to ensure proper adhesion between the plaster and wall surface. Stucco and other forms of plaster can be applied over paint. Plaster applied over a painted surface should not be more than ¼ inch thick. Anything thicker may not adhere well to the wall surface, and may show cracks when dry. Commonly used plaster applied over paint in the faux finish industry includes Venetian plaster and drywall compound finishes. Remember to test samples first on sections of drywall before working directly on the wall. The texture look is permanent and is difficult to remove once complete. Sanding any gloss from the painted surface is critical to help the texture bond to the surface. If the paint has too much sheen, it will not grip to the newly applied texture. Use medium grit sandpaper and attach to a sanding pole. Ensure all air vents in the room are closed, and air conditioning or heating systems turned off. Prevent breathing in dust or getting dust specks in your eyes by wearing a protective mask and goggles. Use a drywall trowel to apply texture over your painted surface. Place a small amount of your chosen plaster onto the flat surface of the trowel with a putty knife. 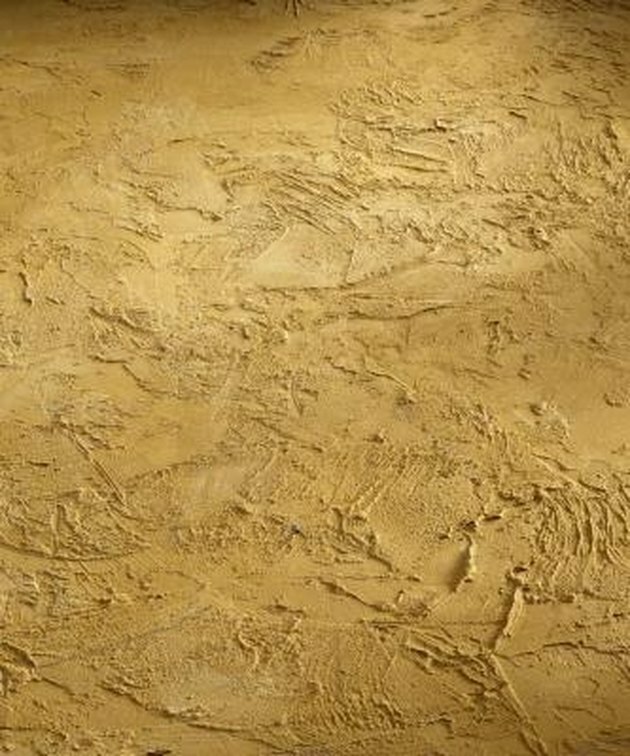 Swipe the trowel against the wall and create a texture. The entire surface does not need to be covered. Remember to only apply thin layers of plaster. Allow the plaster to dry. To test if the texture is ready for an additional layer or paint, touch the surface. If the plaster feels cold to touch, it is still wet underneath. Wait several more hours for it to dry. If you are unsure of the painted surface you want to apply texture over, roll on a coat or two of bonding primer. The primer allows for extra adhesion between the wall and the next applied material, including texture. If the paint is a flat sheen, it is best to add a coat of eggshell or satin paint. The flat paint may absorb too much moisture from the plaster too soon, causing surface cracks to appear.